1. the doctrine or the principles underlying an art as distinguished from the practice of that particular art. 2. a formulated hypothesis or, loosely speaking, any hypothesis or opinion not based upon actual knowledge. 3. a provisional statement or set of explanatory propositions that purports to account for or characterize some phenomenon. The concepts and provisions set forth in a theory are more specific and concrete than those of a conceptual model. Hence a theory is derived from a conceptual model to fully describe, explain, and predict phenomena within the domain of the model. attribution theory a theory developed in an attempt to understand why an event occurred so that later events can be predicted and controlled. care-based theory a type of ethical theory of health care based on the two central constructive ideas of mutual interdependence and emotional response. The ethics of care is a rejection of impartial, principle-driven, dispassionate reasoning and judgment that has often dominated the models and paradigms of bioethics. Its origins are developmental psychology, moral theory, and feminist writings. Its moral concern is with needs and corresponding responsibility as they arise within a relationship. Moral response is individualized and is guided by the private norms of friendship, love, and care rather than by abstract rights and principles. cell theory all organic matter consists of cells, and cell activity is the essential process of life. clonal-selection theory of immunity immunologic specificity is preformed during embryonic life and mediated through cell clones. Cohnheim's theory tumors develop from embryonic rests that do not participate in the formation of normal surrounding tissue. community-based theory any ethical theory of health care according to which everything fundamental in ethics derives from communal values, the common good, social goals, traditional practices, and cooperative virtues. Commitment is to the general welfare, to common purposes, and to education of community members. Beliefs and principles, shared goals, and obligations are seen as products of the communal life. Conventions, traditions, and social solidarity play a prominent role in this type of theory. Called also communitarianism. continuity theory a theory of motor development that postulates that motor changes occur in a linear fashion during an individual's life and that each change is dependent on the development of the prior period. deontological theory a type of ethical theory that maintains that some features of actions other than or in addition to consequences make the actions right or wrong. A major postulate is that we may not use or mistreat other people as a means to our own happiness or to that of others. Deontological theories guide action with a set of moral principles or moral rules, but it is the actions themselves and their moral properties that are fundamental. This theory is sometimes called the Kantian theory because the work of Immanuel Kant (1724–1804) has a deep effect on its formulations. discontinuity theory each stage of motor development has a new and unique feature that is added to distinguish it from the previous stage. family systems theory a view of the family as a dynamic, interactive unit that undergoes continual evolvement in structure and function. There are subsystems that are discrete units (such as mother-father, sister-brother, and mother-child) and there is a suprasystem (the community). The main functions of the family are considered to be support, regulation, nurturance, and socialization; specific aspects of the functions change as the subsystems interact with the suprasystem. feminist theory a type of ethical theory whose core assumptions are that women's experiences have not been taken as seriously as men's experiences and that there is subordination of women, which must end. A central theme is that women's reality is a social construction and not a biological determination. See also feminist praxis. gate theory (gate-control theory) neural impulses generated by noxious painful stimuli and transmitted to the spinal cord by small-diameter C-fibers and A-delta fibers are blocked at their synapses in the dorsal horn by the simultaneous stimulation of large-diameter myelinated A-fibers, thus inhibiting pain by preventing pain impulses from reaching higher levels of the central nervous system. The gate-control theory of pain. From Linton et al., 2000.
general systems theory a theory of organization proposed by Ludwig von Bertalanffy in the 1950s as a means by which various disciplines could communicate with one another and duplication of efforts among scientists could be avoided. The theory sought universally applicable principles and laws that would hold true regardless of the kind of system under study, the nature of its components, or the interrelationships among its components. Since the introduction of the general systems theory, theoretical models, principles, and laws have been developed that are of great value to scientists in all fields, including those of medicine, nursing, and other health-related professions. 1. all organisms are developed from a cell. 2. infectious diseases are of microbial origin. theory of human becoming a theory of nursing formulated by Rosemarie Rizzo parse. Principles of Martha Rogers' science of unitary human beings are synthesized with major tenets and concepts from existential phenomenological thought to create a conceptual system and theory. Major areas of focus, rooted in the human sciences, describe the unitary human being interrelating with the universe in co-creating health. Essential concepts include the human-universe-health interrelationship, the co-creating of health, and the freely choosing of meaning in becoming. Humans are unitary beings mutually co-creating rhythmical patterns of relating in open interchange with the universe. The human being is a unity of the subject-world relationship, participating with the world in co-creation of self. Health, in this theory, is a continuously changing process that humans participate in co-creating. Health is human becoming. It is not the opposite of disease, nor is it a state that exists. Disease is viewed as a pattern of the human being's interrelationship with the world. Nursing is both science and art. The science is nursing's abstract body of knowledge lived through the art in service to people. Three principles of this theory comprise the abstract knowledge base used to guide nursing research and practice. The principles of structuring meaning multidimensionally, co-creating rhythmical patterns of relating, and co-transcending with the possibles provide the underpinnings for practice and research. There is a particular nursing practice methodology, the only one that evolves directly from a nursing theory. Parse's practice methodology specifies that the nurse be truly present with the person and family illuminating meaning, synchronizing rhythms, and mobilizing transcendence. Persons choose their own patterns of health, reflective of their values. The nurse is there with the person and family as they uncover meanings and make decisions about their life situations. True presence is an unconditional love grounded in the belief that individuals know the way. Parse has also constructed a research methodology congruent with her theory and unique to nursing. Her research methodology offers the researcher the opportunity to study universal lived experiences from the perspective of the people living the experiences. The purpose of her basic research method is to uncover the meaning of lived experiences to enhance the knowledge base of nursing. Parse has contributed to nursing science a theory with congruent practice and research methodologies. theory of human caring a nursing theory formulated by Jean watson, derived from the values and assumptions of metaphysical, phenomenological-existential, and spiritual conceptual orientations. The primary concepts of the theory, transpersonal human caring and caring transactions, are multidimensional giving and receiving responses between a nurse and another person. Transpersonal human caring implies a special kind of relationship where both the nurse and the other have a high regard for the whole person in a process of being and becoming. Caring transactions provide a coming together in a lived moment, an actual caring occasion that involves choice and action by both the nurse and another. Person (other) is defined as an experiencing and perceiving “being in the world,” possessing three spheres; mind, body, and soul. Person is also defined as a living growing gestalt with a unique phenomenal field of subjective reality. The environment includes an objective physical or material world and a spiritual world. Watson defines the world as including all forces in the universe as well as a person's immediate environment. Critical to this definition is the concept of transcendence of the physical world that is bound in time and space, making contact with the emotional and spiritual world by the mind and soul. Health is more than the absence of disease. Health is unity and harmony within the mind, body, and soul and is related to the congruence between the self as perceived and the self as experienced. Nursing is defined as a human science and an activity of art, centered on persons and human health-illness experiences. The goal of nursing is to help persons gain a higher level of harmony within the mind, body and soul. Nursing practice is founded on the human-to-human caring process and a commitment to caring as a moral ideal. The activities of nursing are guided by Watson's ten carative factors, which offer a descriptive topology of interventions. The nursing process is incorporated in these carative factors as “creative problem-solving caring process,” a broad approach to nursing that seeks connections and relations rather than separations. information theory a mathematical theory dealing with messages or signals, the distortion produced by statistical noise, and methods of coding that reduce distortion to the irreducible minimum. information processing theory a theory of learning that focuses on internal, cognitive processes in which the learner is viewed as a seeker and processor of information. Lamarck's theory the theory that acquired characteristics may be inherited. Metchnikoff theory the theory that harmful elements in the body are attacked by phagocytes, causing inflammation; see also metchnikoff theory. middle range theory a testable theory that contains a limited number of variables, and is limited in scope as well, yet is of sufficient generality to be useful with a variety of clinical research questions. 1. a framework designed to organize knowledge and explain phenomena in nursing, at a more concrete and specific level than a conceptual model or a metaparadigm. 2. The study and development of theoretical frameworks in nursing. quantum theory radiation and absorption of energy occur in quantities (quanta) that vary in size with the frequency of the radiation. recapitulation theory ontogeny recapitulates phylogeny; see also recapitulation theory. rights-based theory a type of ethical theory under which the language of rights provides the basic terminology for ethical and political theory; it maintains that a democratic society must protect individuals and allow all to pursue personal goals. The idea of primacy of rights has been strongly disputed by, for example, utilitarians and Marxists. Individual interests often conflict with communal or institutional interests, as has been seen in efforts to reform the health care system. A prominent rights-based theory is what is known as liberal individualism. teleological theory a type of ethical theory that takes judgments of the value of the consequences of action as basic. Utilitarianism is the most prominent consequence-based theory; it accepts one and only one basic principle of ethics, the principle of utility, which asserts that we ought always to produce the maximal balance of positive value over negative consequences (or the least possible negative consequence, if only undesirable results can be achieved). Young-Helmholtz theory the theory that color vision depends on three sets of retinal receptors, corresponding to the colors of red, green, and violet. 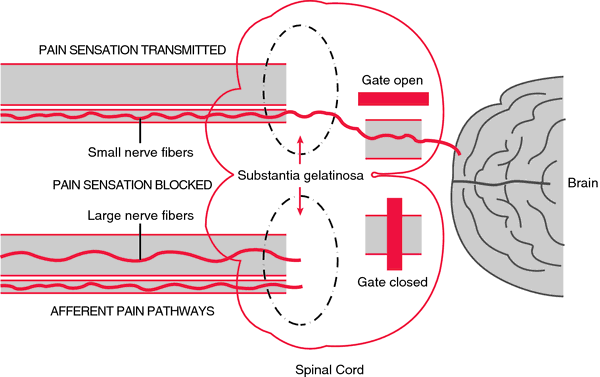 a theory to explain the mechanism of pain; small-fiber afferent stimuli, particularly pain, entering the substantia gelatinosa can be modulated by large-fiber afferent stimuli and descending spinal pathways so that their transmission to ascending spinal pathways is blocked (gated). Proposition to explain mechanism of pain.